One of my daughter’s favorite things is cranberries for the holiday season. I think she could eat a whole bowl of them herself, plus she adores pears!! With those both in mind we made Cranberry Pear Almond Chutney. The chutney would be the perfect accompaniment to chicken, turkey, pork or ham for the holidays. A warmed brie would be wonderful to pair with this also and it would make such a pretty topping. Furthermore it makes a gorgeous little gift for a hostess or as part of a kitchen basket for Christmas. This is a simple condiment to can and one that is perfect in little jars. Simply decorating the jars or add a label with the name of the recipe and the date it was canned. Fill up a larger one for yourself and have the small 4 oz. jars for gifts. You might even be tempted to make a double batch of this for the holidays as it may be gone by Thanksgiving!! This chutney is sweet, tart, nutty and super flavorful. Cranberries just sing for the holiday season and are found in abundance!! Their pretty colour makes your table and your dinner plate even more appetizing and festive!! 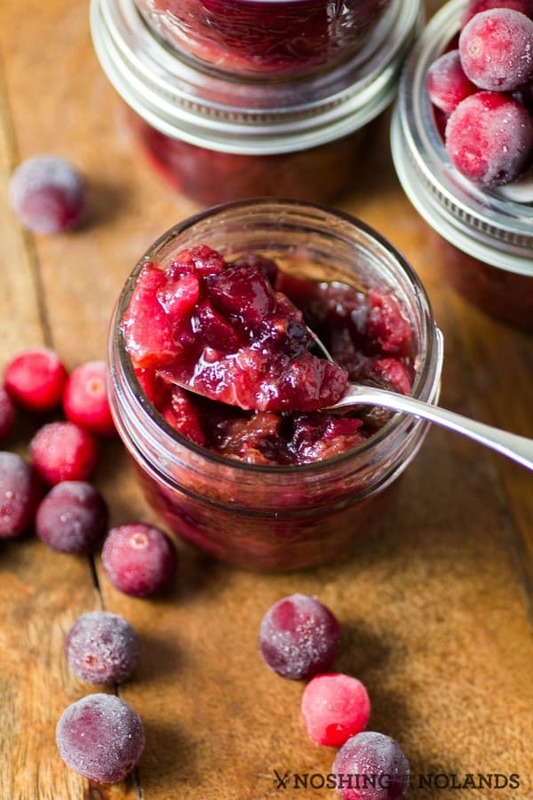 Using either fresh or frozen cranberries works with this recipe. Lastly the addition of warming spices like cinnamon, nutmeg and ginger make this chutney even more delicious. Also noteworthy, is the raisins and orange zest and juice to completely round out this wonderful condiment. 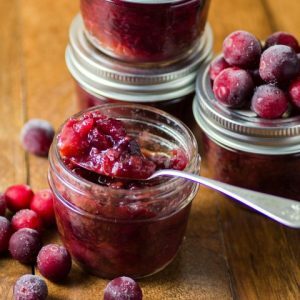 A gorgeously coloured Cranberry Pear Almond Chutney that is perfect with ham, turkey or a warmed brie cheese. Add raisins to the hot water and let sit for 20 min. to plump, then drain reserving a ½ cup of liquid. Set raisins aside. In a large pot add the reserved water along with the sugars and vinegar. Cook, stirring slowly to dissolve sugar and then bring up to a boil. Cook syrup for about 15 min. without stirring. Add the orange zest, orange juice, ginger, and cranberries. Bring back up to a boil and cook for 10 min. until mixture starts to thicken enough to mound onto a spoon. The cranberries should have popped for the most part. Add in the pears, almonds, raisins, cinnamon and nutmeg. Boil for an additional minute. Soak lids in hot water for 5 min. Ladle into sterilized jars, leaving a ½" head space. Wipe down rims with a clean cloth. Apply the lids and close with the rims to finger tip tight. Process in a water bath. Cover the jars with at least 1-inch of water. Bring to a rolling boil and process for 10 minutes. Then turn off heat and let the jars sit in the hot water for 5 minutes. Remove to a towel lined counter and let rest until lids have sealed and the jars are cooled. If any don't seal place in the fridge and use within 3 weeks. This is probably my mom’s favorite kind of fruit. I know without a doubt that if I make this at Christmas she would eat it as candy. I cannot wait to make it for her. Oh, that looks amazing! I always love the spicy sweet of a good chutney, and these flavors sound so good! I love cranberry and being from Southern New England, we have lots of them. My kids start to panic if they thing my mom isn’t making cranberry sauce for Thanksgiving. They’ve never had it as a chutney, I should make it for them. Yum! I think this sounds awesome. I have to try it. I love all three flavors and together I bet they are great. I love cranberry with anything. Looks great. I love cranberry so this sounds really good! I love cranberries!! Your recipe sounds soooo yummy! I have never heard of chutney before. Is it an american thing? Chutney is an Indian condiment which is also popular in the Carribean. 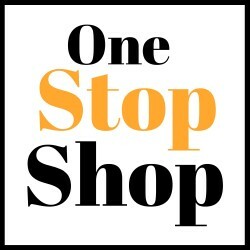 It now is very popular worldwide and has many, many variations. I love a great chutney with curries!! This recipe looks so delicious and easy to make. I will have to get the ingredients I need to try this on the weekend. My family is going to love Cranberry Pear Almond Chutney. I have never made chutney before but it looks pretty easy to make. I am excited to give it a try. This looks so good. I can’t wait for the cranberries to be out for the holidays. Right now they are a bit hard to find. What a delish twist on chutney using cranberries. I always buy cranberries fresh at Thanksgiving and then freeze and use them the rest of the year. So I’m going to try making your recipe this weekend. Oh, this is really interesting Tara. I like chutney, and long ago I used to make a cranberry catsup that is similar to this. The almonds add a great note to all the flavors. I am making this soon since all the ingredients are popular at our house.